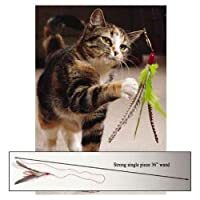 The Da Bird Value pack includes an original full-length 36" rod and two refills, to extend your cat's fun and entertainment. The realistic bird sight and sounds will keep your cat stimulated. Original full length 36" rod TWO refills! Da Bird Mimics the Look & Sound of a Real Bird in Flight! Cats are so crazy about this toy that you have to hide it when not in use- I'm not kidding! great way to exercise your cat and have lots of fun while your at it!